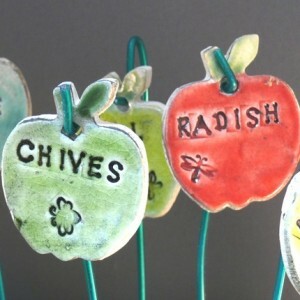 I’m absolutely in love with these stoneware clay plant labels! In the shape of a tomato (2.25″ x 3.25″), each plant marker has a different veggie or herb imprinted. There are 30+ markers to choose from and each one comes with an 8″ stake. Since the markers are fired and glazed you can use them year after year. Price: 3 markers for $24, but Deb has offered a Buy One, Get One Free deal (with no quantity limit!) for Frugal Bon Vivant readers! Just mention BOGOBonVivant in your note to the seller (including what stakes you want) to get 6 markers for $24. Thanks Deb! I first ran across these WWII “propaganda” victory garden posters in late spring (when the nation was victory garden and Michelle Obama-crazy! ), when I was searching for victory garden prints. I’m a huge fan of vintage-y posters, so these updated versions are really cool! They would be perfect for a mud room/gardening area or even in a kitchen. 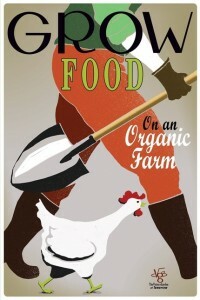 My favorites: Grow Food on an organic farm, Break New Ground. Plant an urban garden, and Keep ‘Em Flying. You can raise your own chickens. 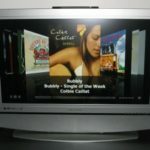 Price: 1 – 12″x18″ poster for $12. 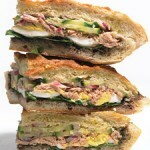 Joe has offered Frugal Bon Vivant readers a Buy One, Get One Free deal until the end of August! Just mention “my frugal poster” (and then write in what poster you want for free) in the comments section at checkout to get 2 posters for $12. Sweet deal, Joe! These seed bombs come in the cutest little printed bags. If you need inspiration to join the guerrilla gardening movement, these should do the trick! So go practice random acts of gardening with this 4.5 ounce wildflower mixture. Price: 1 packet (5 seed bombs) for $6. Maya has also offered Frugal Bon Vivant readers a Buy One, Get One Free deal until the end of August! Just mention “BOGOFrugal” in the comments section at checkout to get 2 seed packs for $6. Thanks Maya! Here’s another “victory garden” themed item. 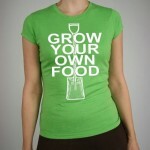 I’m loving this ” Grow Your Own Food” shirt. 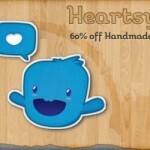 Cute and simple design. 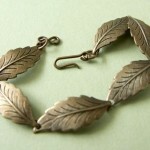 OK, gardeners & non-gardeners: what’s your latest Etsy find? 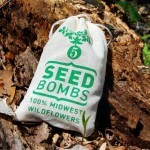 Olivia, thanks so much for including our Midwest seed bombs in your round-up!